What is Focal Segmental Glomerulosclerosis (FSGS)? FSGS is a rare, potentially life-threatening disease that attacks the kidney’s filtering units (glomeruli), causing serious scarring which leads to permanent kidney damage and even renal failure. FSGS is one of the leading causes of Nephrotic Syndrome (NS) and is identified by biopsy and proteinuria. Similar to lupus nephritis, early clinical response (measured by reduction of proteinuria) is thought to be critical to long-term kidney health in patients with FSGS. FSGS often occurs without a known or obvious cause, which is known as idiopathic or primary FSGS. Secondary FSGS is caused by a disease, infection or drug, such as diabetes, lupus, HIV, sickle cell disease, or another glomerular disease, in which the kidney’s glomeruli are attacked. There are currently no FDA or EMA approved therapies for the treatment of FSGS. 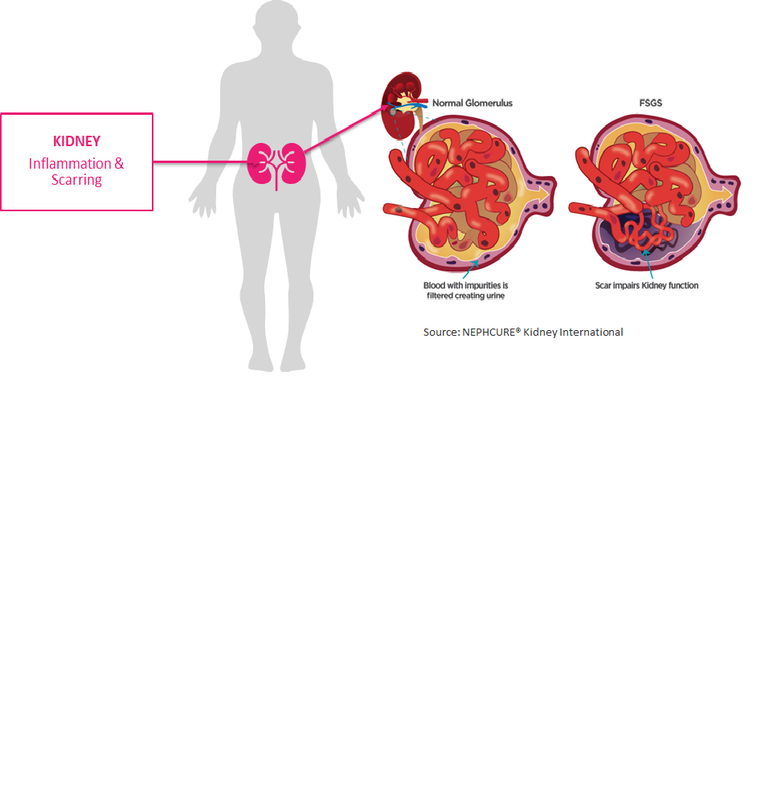 For more information on FSGS, please visit NEPHCURE® Kidney International.